This repository contains the experimental results of identifying and typing named entities in English Wikipedia sentences. Even though current named entity recognition tools achieve nearly human-like performance or particular data types or domains, they are still highly dependent on the gold standard used for training and testing. The mainstream approach of gathering ground truth or gold standard for training and evaluating named entity recognition tools is still by means of experts, who are typically expensive and hard to find. Furthermore, for each new input type, or each new domain, new gold standards need to be created. Overall, the experts follow over-generalized annotation guidelines, meant to increase the inter-annotator agreement between experts. Such guidelines are thus prone to denying the intrinsic language ambiguity, multitude of perspectives and interpretations. Thus, ground truth datasets might not always be 'gold' or 'true' in terms of capturing the real text meaning and interpretation diversity. In the last decade crowdsourcing has also proven to be a suitable method for gathering such ground truth, but data ambiguity is still not handled. However, in our work we focus on capturing the inter-annotator disagreement to provide a new type of ground truth, i.e., crowd truth - by applying the CrowdTruth metrics and methodology, where language features are taken into consideration. All the crowdsourcing experiments were performed through the CrowdTruth platform, while the results were processed and analyzed using the CrowdTruth methodology and metrics. For more information, check the CrowdTruth website. For gathering the annotated data, we used the CrowdFlower marketplace. Crowdsourcing experiments for correcting and improving the Multi-NER output and also for improving the expert-based gold standard (MultiNER+Crowd). Various aggregated datasets for analyzing the output of multiple state-of-the-art named entity recognition tools (SingleNER), their combined output (MultiNER) and crowdsourcing data for correcting and improving the MultiNER approach and the gold standard. EntityScore: the likelihood of an entity to be in the gold standard based on how many NER tools extracted it. The score is equal to the ratio of NER tools that extracted the entity. The files contain the input for the crowdsourcing tasks for each dataset. An input unit is composed of a sentence and a set of expressions that refer to a named entity. The raw data collected from crowdsourcing tasks for each of the 2 datasets. Crowd reduces the number of FP: For each named entity in the ground truth that has multiple alternatives (span alternative) we create an entity cluster. We also add the largest span among all the alternatives. Crowd reduces the number of FN: For each named entity in the ground truth that was not extracted, we create an entity cluster that contains the FN named entity and the alternatives returned by the NER. Further, we add every other combination of words contained in all the alternatives. This step is necessary because we do not want to introduce bias in the task, i.e., the crowd should see all the possibilities, not only the expected one. selection of the type for each expression in the list, from a predefined set of choices - place, person, organization, role and other (Step 3 from the crowdsourcing template below). 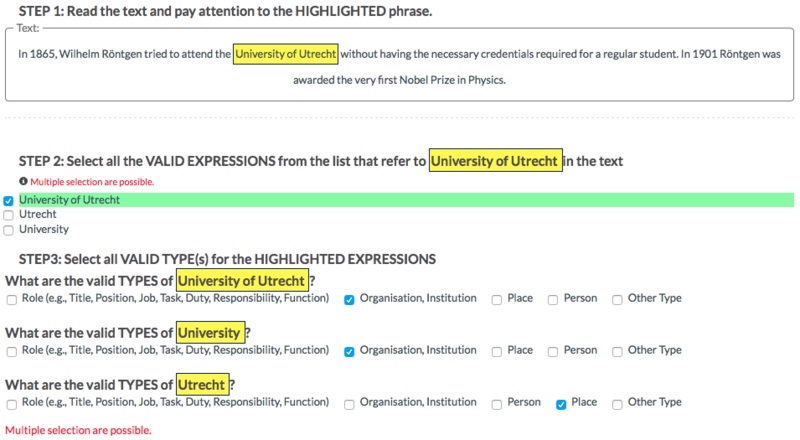 The input of the crowdsourcing task consists of a sentence and a named entity for which multiple expressions were given by the five state-of-the-art NER tools. Check the crowdsourcing templates below. In order to compare the performance of individual state-of-the-art named entity recognition tools with our MultiNER approach, we analyze all the named entities in the gold standards and all their alternatives that were extracted by any individual state-of-the-art named entity recognition tool. false negative (FN): the named entities in the gold standard that were not extracted by any NER, nor the Multi-NER. In order to understand which are the most problematic types we perform a similar analysis at the level of entity surface and entity type. We measure and plot here (1) the Multi-NER+Crowd performance (the Multi-NER improved through the crowdsourcing task) compared to the Multi-NER approach; and (2) the Multi-NER+CrowdGT, a crowd-improved ground truth, by using a manual evaluation of the crowd results.